My son was terrified of the coffee. He kept shrieking he didn’t like it. I had a really hard time convincing him that, not only did he not have to drink it, in fact I didn’t even want him to taste it. I have not been able to get the glowing eyes working for the costume yet. My local store no longer carries the C-3PO Coffee-Mate creamer. They still had lots just a couple of weeks ago. We broke the Hubby’s favorite stormtrooper mug a few weeks ago. 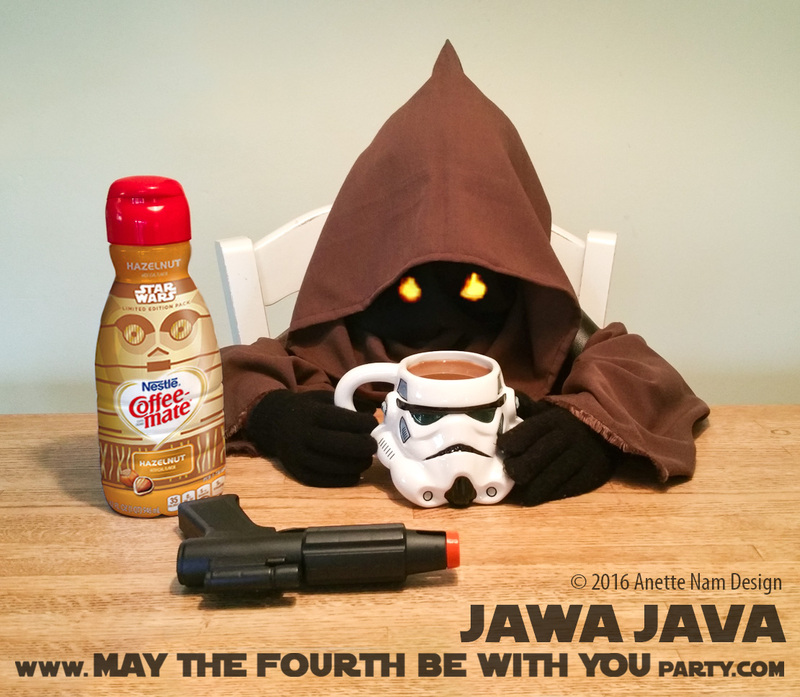 Once I promised my son he could play with the blaster, and keep it on the table, the coffee was no longer a threat. Glowing digital eyeballs were “borrowed” from a real Jawa and inserted into our picture. Regular Coffe-Mate creamer was bought, label removed, and a screen shot of Coffee-Mate’s official shot of the Star Wars bottle was superimposed. Gotta love Photoshop! Luckily, I already bought a new mug for the Hubby for his birthday (which is not for a while yet), so I carefully unwrapped it, used it, cleaned it, and wrapped it back up again. Don’t tell him! Note: I promise I will post more pictures and a complete DIY post on how we made the Jawa costume! Make STRONG coffee. If it does’t make you shudder, and scream WUTINI in a falsetto voice, it is NOT strong enough. Add creamer and sugar to taste. Jawa Costume: We will do a complete DIY post, closer to fall. ← Ultimate “May the Fourth be with You” Party Menu!